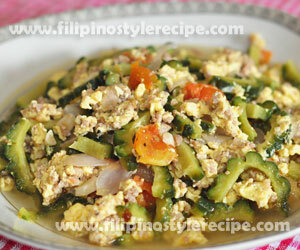 Filipino Style Recipe: Sarciadong ampalaya or bitter gourd sarciado is another healthy yet affordable dish. The bitter gourd sauteed with ground pork then cooked and simmered with tomatoes and beaten eggs. 1. Rub bitter gourd with salt and leave for 10 minutes then squeeze until the juice comes out. Rinse, drain and set aside. 1. In a pan, heat oil and saute garlic, onion and tomatoes. 3. Add water and bring to boil then add bitter gourd. Cover and simmer for 3 minutes. 4. Add beaten eggs then stir cook until eggs are firm. 5. Season with salt and pepper according to taste. Remove from heat and serve hot!